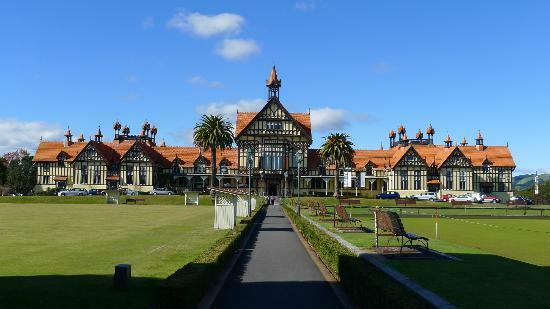 Newzealand : If you had only one day in the North Island of New Zealand and you asked me where should one go for that day I would without hesitation say Rotorua. 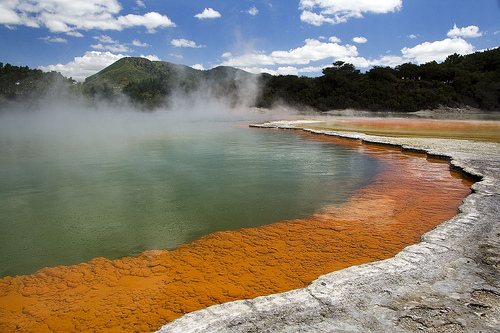 Rotorua is approximately 2.5 - 3 hours drive south of Auckland. Head south through Hamilton and Cambridge, or for a quicker route via Mata Mata. Shortly after Cambridge turn left and take the number 5 which will lead you right to Rotorua. 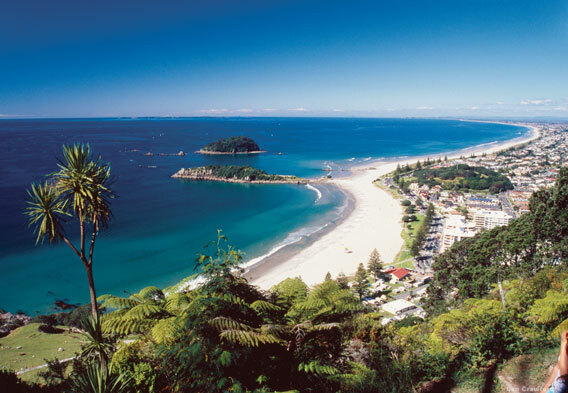 Coming up from Wellington head to Lake Taupo and take the number 5 to Rotorua. Train and Bus routes also service Rotorua. 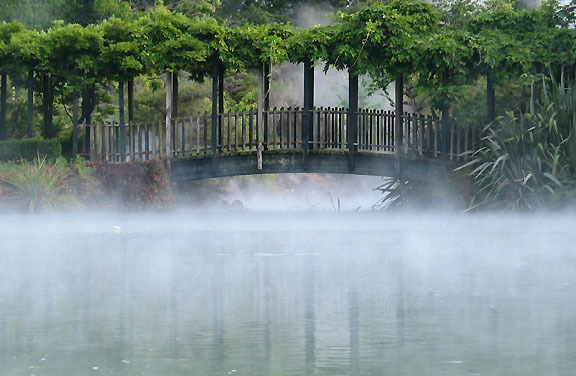 Rotorua is a jewel in the North Island, with geothermal wonders, a center of Maori Culture, Parks, Lakes, Natural History and numerous modern day attractions. Most visitors comment on the smell when they arrive. It is Hydrogen Sulphide (rotten egg gas) and while distinct at first, if you stay for any length of time you will adapt and seldom notice it. 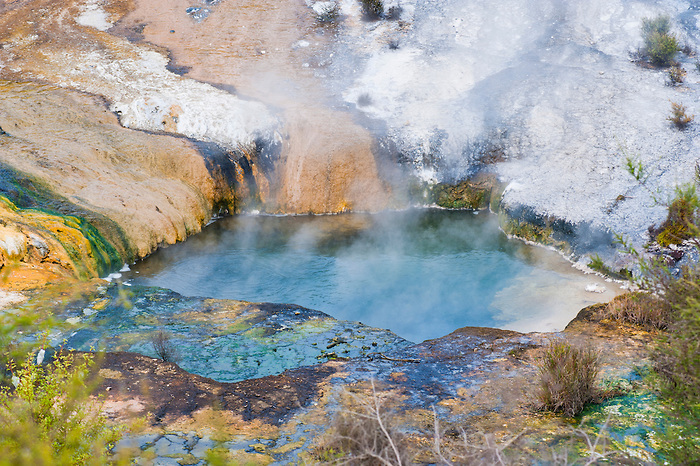 The main geothermal parks in Rotorua and its surrounds include Whakarewarewa thermal area, Waimangu Volcanic Valley, Waitapu Thermal wonderland, Orakei Korako Geyserland and Hell's Gate. All these required payment. Visiting this site used to be standard fare in any visit to Rotorua. Unfortunately the park has now divided into two parts, and many don't believe either site has enough to stand alone. So what you used to get for one entry price now costs two (be warned). On the Hemo Road entrance is the NZ Maori Arts and Crafts Institute with its master carvers. Also includes a weaving house, kiwi house, and Maori meeting house. Pohutu (big splash) and the Prince of Wales geyser are also on this side. (Prince of Wales geyser so named because the 3 directions the geyser shoots out resembles the feathers on the Prince of Wales crest). On the Tyron street entrance you get another meeting house where a cultural show is put on, a village, shops and some hot pools, etc. Also here outside school hours you may find the local Maori children willing to jump off the bridge into the stream below in return for chasing your loose change. A nice walk along a valley with numerous hot pools, lakes, and near the end of the track the Warbrick thermal terrace - a multi coloured silica terrace, probably the most colourful terrace in Rotorua. Worth a visit if you have already seen some thermal parks and want more, or like a more expansive tour, you can link with a boat tour. (see the gallery for some photos courtesy Waimangu's website). The pink and white terraces once existed in the area prior to the 1886 eruption. About 20 min. south of Rotorua towards Taupo. Be prepared to walk a bit. Numerous rainbow pools, the huge champagne pool, artist palette, sulphur vents, boiling mud and a huge silica terrace. If you arrive early in the morning, before 10am, a short drive leads you to the Lady Knox geyser that gets set off once a day by them feeding it with soap, cost of this is included in your admission (was $25 an adult). Also on this road is a natural mud pool which is the best display of boiling mud you could have seen and its free. Closer to Lake Taupo than Rotorua on a side road connecting route 5 to the main route 1. You need to catch the ferry across the lake to begin exploring the park. Like most of the parks good tracks requiring you to walk to see mud pools, a large cave, the emerald terrace and the largest silica feature in the country. Worth the visit if you are passing that way. Another thermal park with numerous boiling things, including Adam's frying pan, a mud volcano, hot water falls and one of the few places you could buy the multi-colour sand in a glass container (quite pretty). Once visited by Mark Twain who stated he would have gladly paid not to have gone there. We'll have to disagree; it’s worth the visit. 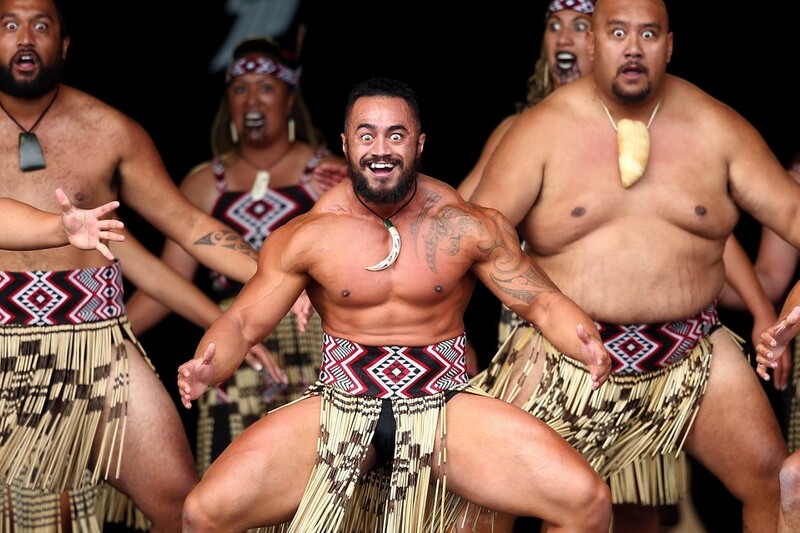 Rotorua has plenty of Maori based attractions. 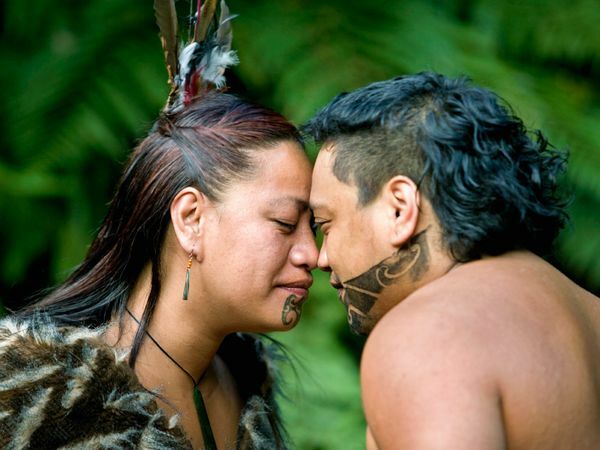 These include Tamaki Maori Village. The NZ Maori Arts and Crafts Institute (already spoken about), the Buried Village and numerous Hungi and Cultural Performances. The Buried village is what it sounds like, a half buried village. During the 1886 eruption a number of local Maori perished buried in mud. Some of the village has since been dug out and rebuilt to give tourists an idea of a Maori village. 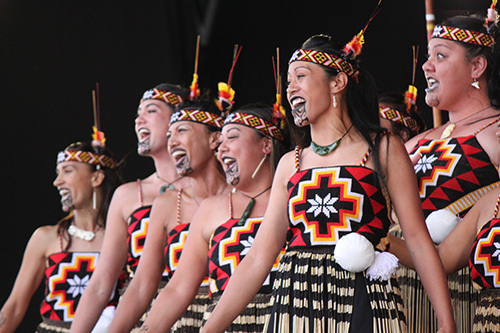 If you really want to get a good taste of Maori culture food and hospitality then book one of the many feasts and concerts put on by the local hotels. The food, music and friendship are always top rate. A nice park with trout fish as its centerpiece, beautiful clear running water and a top bushland. Lovely walking tracks and you can feed the fish. 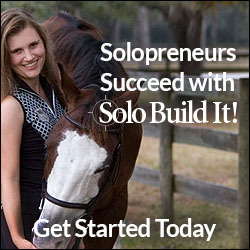 Also has a farm show attached. The main reason to take this ride on a gondola is not just to get to the top for the view, the main reason is to ride the luge. Massive fun, as long as you don't fall off. 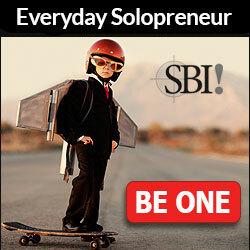 They have a small chairlift operating so that you can ride the luge for as long as your budget can afford. Everything you wanted to know about sheep. Surprisingly a show about sheep and farming in NZ is interesting and entertaining. One of the first buildings built in NZ solely with tourists in mind. Originally built as a bath house and hot water treatment center it has now been converted. Good museum but the highlight is the movie on local history, sit down and be sure to be holding on - a total multimedia experience. The building itself is one of the finest examples of Edwardian design and is an art piece in itself. The surrounding gardens are always nicely maintained. Just North from Lake Taupo on the M1 is Huka Falls and the world famous Huka Falls Lodge (for the novu-rich of the world). 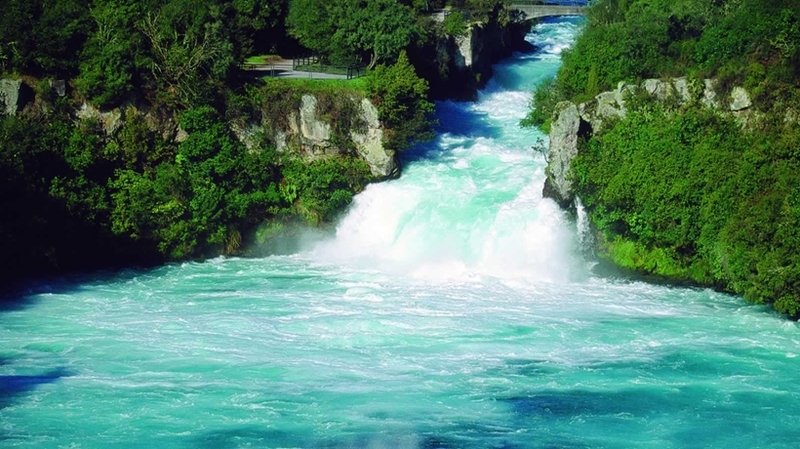 Huka Falls itself is free for all. Near the beginning of the mighty Waikato river (NZ longest river) it’s not the height of the falls but the sheer volume of water that is forced through which is impressive, few people have gone over the falls and survived. Boat trips are now run up to the base of the falls for those wanting a different perspective. On the road to the blue and green lakes. 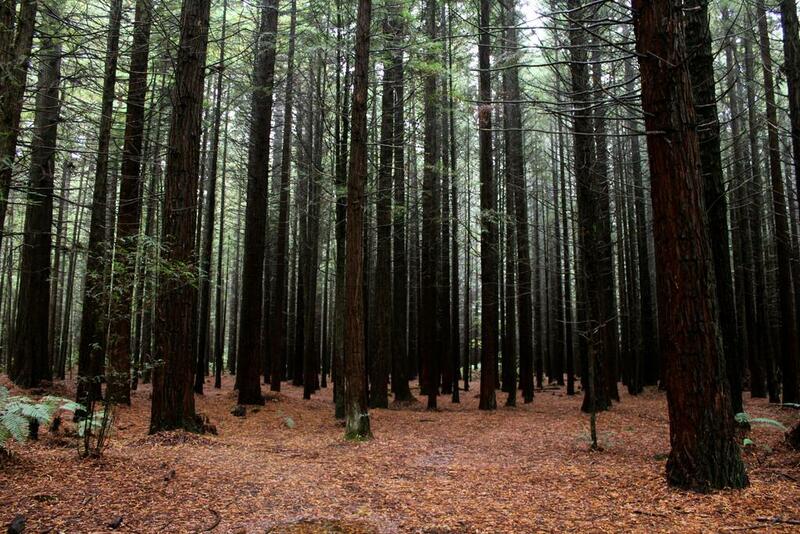 Contains beautiful stands of redwood trees, walking and horse riding tracks. The redwood trees are relatively young for trees, but they are already huge in size. 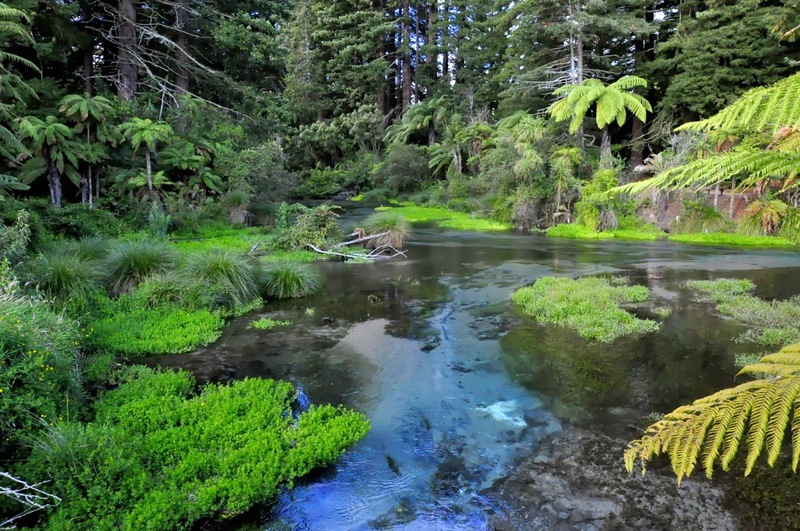 Opposite the main hospital on Kuirau road is Kuirau Park with numerous boiling pools and geothermal activities. Contains some foot pools to ease your sore feet and a children’s park with miniature railway. On a recent visit there was a huge hole in the ground and several trees blown over or covered in mud due to a localized eruption. It is a reminder the whole area is geothermally active and has the potential to be dangerous. Past Whakarewarewa Forrest Park is the blue lake, great for swimming or boating activities, clear water with a pumice bottom, those further out there is a problem with weeds. Keep going on the road to get a view of Mt. Tarawera. 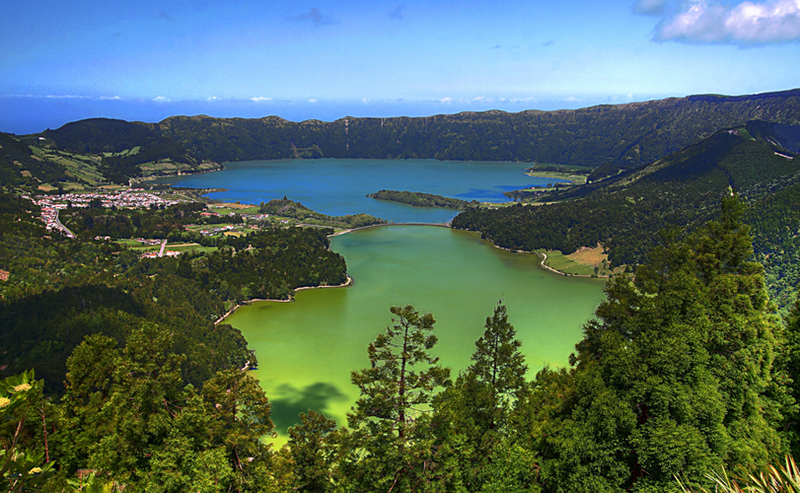 The green lake is banned and tapu (Maori for cursed, sacred, special) and no one is supposed to enter it. For the true adventure fanatics. Take the back road and climb Mount Tarawera. Enter the crater and run down to the bottom at full speed. The massive crater was caused by the 10 June 1886 eruption which destroyed the pink and white terraces and buried many villages. The number of lakes is simply too many to mention. Great for trout fishing, boating or picnics. Some lakes even have black volcanic glass and/or pumice stone lying on their shores. If you want to see a beautiful spring feed stream, this is worth a visit, pure water with a hint of blue flowing over white pumice bed. There is also a nice stand of redwoods and I would be surprised if you didn’t' see any trout in the stream (no fishing allowed, sorry). 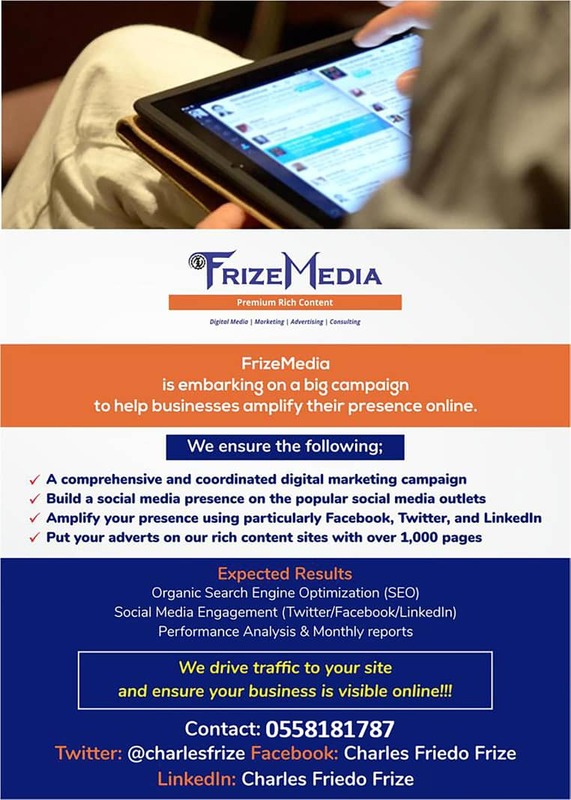 This list is by no means exhaustive and like any tourist destination new venues are always opening up. Hopefully this provides you with a basic to do list when visiting.